Google Keep is usually referred to as being in the same class as Evernote, OneNote, DEVONthink and Apple Notes. However, in practice it's just not in the same league. That's really surprising in a product from Google, which typically goes by the rule that with great power comes terrible design. Google Maps and Gmail, for instance, are both vastly more powerful than their rivals but are maddeningly fiddly to use. Google Keep isn't fiddly but it has little power, barely enough to make this better than sticking Post-It notes on your screen. 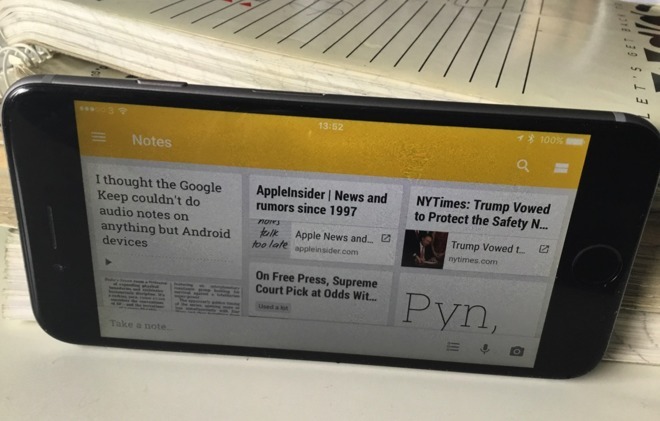 If design were just about appearance, then Google Keep beats all comers. It is bright, colorful and modern-looking where all of its rivals could do with some new paint on the edges. However, design encompasses both how something works and how you use it. The reason for getting one of this type of note app instead of just staying with TextEdit or saving things in your email is generally two-fold. The most important reason is a need to manage a lot of information, which means storing and quickly retrieving all sorts of data from text you've typed to PDFs you've dragged in. The next most important is the ability to very quickly add new information. 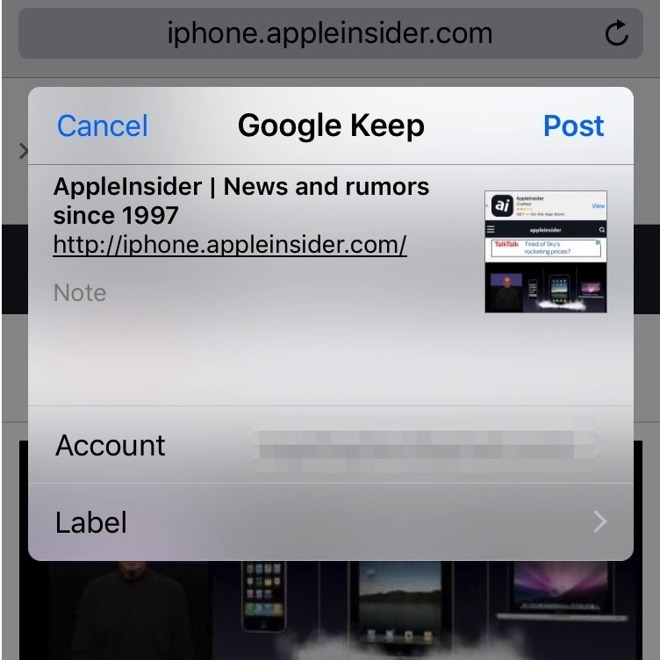 If you already have Google Keep open on your Mac's browser than you can swiftly drag certain items to it. You can also immediately start typing notes into a blank section at the top of the page. If you already have Google Keep open on your iOS device then you can tap Take a Note and begin writing. It's just when you don't happen to have the site or the app open that it's a chore. Evernote optionally gives you a menubar app on Mac that you can call up with a keystroke and start typing into. DEVONthink has a similar feature called up by a keystroke or by opening the Sorter on the side of your Mac screen. Google Keep has nothing like this. You really need to be in it all the time to make it worth using. The service and app Google Keep can store text and images in GIF, JPEG, PNG and Google's own WEBP format. They must be less than 10MB and 25 megapixels. You'll note that we didn't mention PDFs —more on that in a bit. You can add voice notes on iOS, even though Google's own support pages say this feature is exclusive to Android devices. If you do add voice notes then, very nicely, what you say is transcribed automatically. No other note service we tried has this feature. If you're using the iOS app or the Chrome browser then you can save web pages but what it really saves is a bookmark to them. So you can't archive a page as it appears today, you can only store a link to it. Most significantly of all, you can't add any PDFs to Google Keep. So if you're collecting any research, gathering any information, you have to have a second app: Google Keep cannot be your sole one. Consequently, Google Keep is for notes you type yourself, images within certain quite reasonable limits, and bookmarks to web pages. Even with the limitations, you can still end up with a lot of notes over time - and that's another area where Google Keep is very weak. As it's a Google product, there is an extensive and powerful search feature to help you find a note you've written. However, you cannot, say, group all your notes about a planned vacation into one notebook as you would in Evernote, one section as you would in OneNote or one database as you might in DEVONthink. You can tag and then you can search on those tags. Plus Google recently introduced an automated tagging feature: Google scans through all your text and categorizes notes based on what it finds. That's nice, and it works, but you don't know what the categories are and you can't impose any other organization on your notes. We said that Google Keep is like sticking Post-It notes on your monitor. It is. 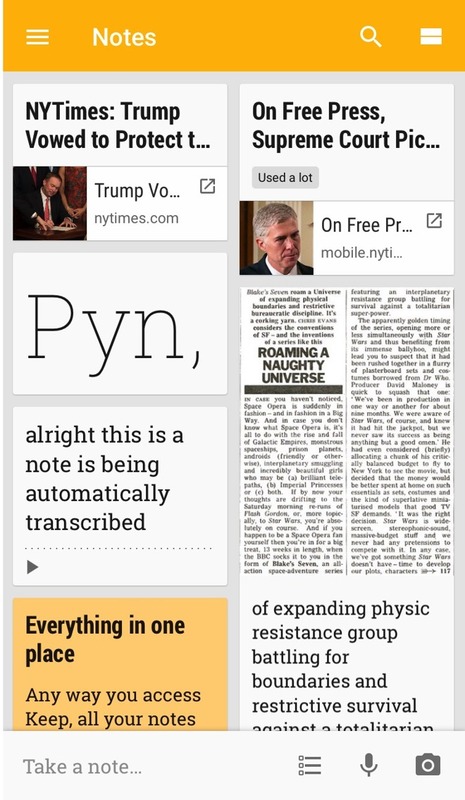 Just as your monitor can only hold so many, treat Google Keep the same. If you just need to jot down something for today, Google Keep is fine. If you are doing any kind of protracted work gathering information, writing lots of notes or trying to organize your thoughts, Google Keep is worthless on its own. It's possible that this will change: the service has continued to develop throughout the four years since its launch. However, Google Keep replaced Google Notebook which did let you organise your notes and was shuttered after six years. The most recent development to Google Keep sees it being added to the company's G Suite of apps that already includes the word processor Google Docs. Now from within Google Docs you can save text to Google Keep. That seems to be just a way of guaranteeing that you end up with more notes than Google Keep can usefully manage for you. It also works the other way, too, letting you save notes to Google Docs. 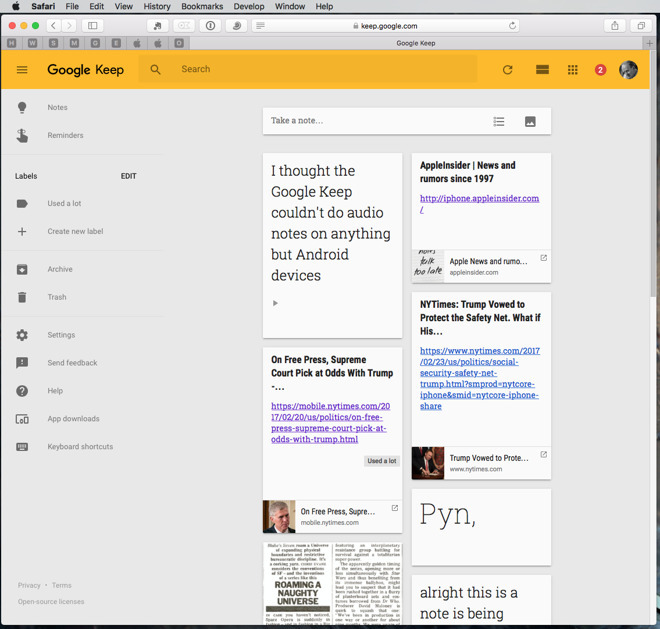 However, that seems like turning Google Docs into an app for keeping the notes you can no longer find in Google Keep. For whatever reason, Google Keep continues to be regarded as a competitor to the likes of Evernote and the rest but that doesn't seem to be what Google wants and it isn't what Google delivers. Google Keep is a free online service and there is an iOS app which requires iOS 8.0 or higher and is on the App Store.